Edward Gorey was a writer and illustrator with a penchant for fur coats, cats, ballet, tennis shoes and macabre Edwardian settings. He illustrated book covers and spot illustrations for Doubleday Anchor early in his career, and later illustrated his own books. 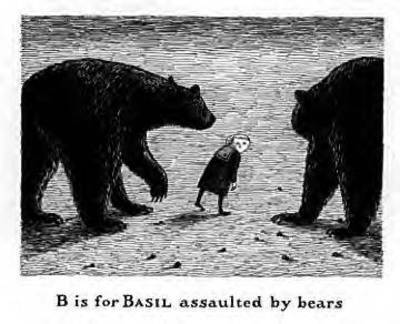 A favorite is “The Gashlycrumb Tinies,” the alphabetical telling of 26 children’s deaths with illustrated rhymes. His animation for PBS’s “Mystery!” brought him even more attention. If you like the surreal, gothic or kooky, then you should def check out Mr. Gorey’s fabulousity.